Reverent docudrama...to those completely unfamiliar with the case, Zodiac should be every bit as satisfying as a true-crime paperback. 156 min. Paramount Pictures. Director: David Fincher. Cast: Jake Gyllenhaal, Mark Ruffalo, Robert Downey Jr., Anthony Edwards, Brian Cox. 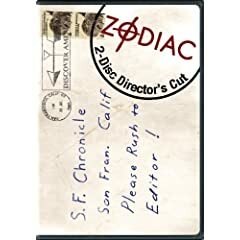 It is, I suppose, appropriate that Zodiac—the San Franciscan chronicle of a real-life, elusive serial killer—should read like a mash note addressed by director David Fincher to true-crime obsession. The Zodiac, after all, achieved his fame precisely because he was a "man of letters," sending taunting commentary, clues, and cryptograms to the staff of the San Francisco Chronicle and, by extension, the SFPD. Fincher's fellow obsessives will understand this movie in their bones, and enjoy seeing the spine-tingling case translated into reverent docudrama, but they're unlikely to gain much insight not already gleaned from years of books, feature stories, and websites that keep the unsolved case burning in our imaginations. To those completely unfamiliar with the case, Zodiac should be every bit as satisfying as a true-crime paperback. In fact, it's downright encyclopedic: scrupulous in its research and attention to detail but, with a few striking exceptions, disinterested in developing drama on the periphery of the central investigation. For those occupying the middle ground between expert and neophyte—in an era of bleeding, leading top stories and their concentrated doses of schadenfreude—the film's 156 minutes may be a case of too much information. Fincher takes as his sources two books by former Chronicle political cartoonist Robert Graysmith (Zodiac and Zodiac Unmasked). The latter, in particular, finds Graysmith emphatically pointing the finger at one suspect; Fincher favors the author's theory while allowing that the case remains inconclusive. Though we experience the story primarily from the perspective of Graysmith (Jake Gyllenhaal), Fincher also trails detectives David Toschi (Mark Ruffalo) and William Armstrong (Anthony Edwards). Robert Downey Jr. plays aloof Chronicle reporter Paul Avery, whose gonzo style prefigured a substance-abusive burnout. 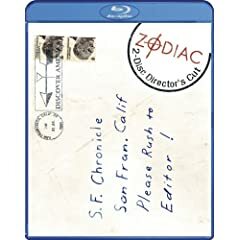 As for the Zodiac, Fincher wisely limits himself to the agreed-upon facts of the "confirmed" attacks: on a lover's lane, a golf course, and the intersection of Washington and Cherry Streets. The killer remains inscrutable and unobtainable; the proliferation of copycats and legitimate suspects makes the Zodiac a Hydra. Zodiac pays tribute to investigation by depicting it at its most real and most maddening: the frustration of detectives trying to coordinate efforts with other police departments, the frustration of reporters trying to get access to case particulars, the frustration of a seemingly irresolvable crime. Toschi and Graysmith meet in the maze, the latter ever pursuing the former and promoting an alliance. Toschi's sense of duty and Graysmith's armchair-detective fanaticism doom them to domestic strife, professional reversals, and two kinds of madness: dull ache and restless fervor. While the killer remains free, his pursuers get strung out playing his most dangerous game ("Nothing makes sense anymore," says one). To the extent that Zodiac has points to make, they are these: how very easy it is to get thousands of people running in circles, how very difficult it is to get justice, and how grateful we should be for the sacrifices of those who try. Fincher points out how the next generation soaks in these lessons, with Graysmith first trying in vain to shield his son, and eventually recruiting his children into a home thinktank (here, Fincher vicariously relives being an all-too-aware se7en-year-old, in San Anselmo, when the Zodiac was publicly threatening Bay Area schoolchildren). In collaboration with cinematographer Harris Savides, Fincher once again demonstrates seductive technique and a pale, sickly palette. Impassive, carefully composed visuals frame exacting recreations of the Bay Area in the late '60s and early '70s. But the director's cold calculation borders on the anti-dramatic; stuffed with decades' worth of developments in the case, the narrative seems almost apologetic when it after-thinks about the characters' personal lives. It's the hazard of a movie called Zodiac: the title character is a time-consuming cipher, a black hole tugging everything into its center. The Zodiac infamously deadpanned, "I am waiting for a good movie about me." Fincher understands and perpetuates the central theme of the case, that it is inextricable from media—the film's most jarring stylistic flourish lays a digital labyrinth of the Zodiac's letters over a montage of intelligence-gathering. The Zodiac took inspiration from The Most Dangerous Game, and Fincher alludes—directly and indirectly—to a heritage of San Franciscan mysteries: Vertigo (a masterwork on obsession), Bullitt (McQueen's hero was based on Toschi), and Dirty Harry (much to Toschi's chagrin, the villain was a Zodiac knockoff named Scorpio). One line of inquiry dead-ends at a creepy projectionist (Charles Fleischer), in a scene that self-consciously plays like a horror-movie come to life. This scene and the three vividly realized Zodiac assaults are pools of adrenaline in the barren land mass of investigative drudgery. As such, the sanguinary thrills function as cinematic entrapment, of the "you know you want it" variety that the Zodiac pushed in his smug letters. Screenwriter James Vanderbilt's script pauses to ponder the case's perverse pull when Avery puzzles over Graysmith's angle: "This is good business for everyone but you." Zodiac may yet prove to be good business, but in another consideration that might have occured to the Master of Suspense, perhaps the film drains the soul of its patrons as much as the monster, and the monstrous obsession, it depicts. In its Blu-ray debut, Paramount's Zodiac: 2-Disc Director's Cut once more impresses with its thorough content. The image quality is generally exceptional—the opening sequence appears to be shot through cheesecloth, but that effect disappears and the transfer settles into crisp detail. Color is always spot-on, and in what be the most important feature of this film's transfer, shadow detail is excellent. The Dolby TrueHD 5.1 soundtrack captures the film's subtle soundscape in every delicate detail. Disc One includes two bonus audio tracks. The commentary by director David Fincher is the key behind-the-scenes feature, as Fincher does not sit for interviews in the Disc Two documentaries. The commentary is packed with expertise about the Zodiac case—Fincher is no slouch in this area—information about the production, and personal reflections (Fincher recalls growing up in the Bay Area in the shadow of the Zodiac). The commentary by Jake Gyllenhaal, Robert Downey Jr., producer Brad Fischer, screenwriter James Vanderbilt and true-crime author James Ellroy is a stitch-job, with the actors recorded separately from the producer, screenwriter and true-crime legend Ellroy. The actors are in a goofy mood, but the writers have interesting observations to make, especially Vanderbilt's accounts of the script's long path to the screen and his own understanding of the case. Disc Two includes fascinating and exhaustive documentaries about the film's making and the true-life Zodiac case. In laying out the details of the production, "Zodiac Deciphered" (54:15, HD) offers extensive set footage, as well as interviews with Fischer, Vanderbilt, costume designer Casey Storm, set decorator Victor J. Zolfo, property master Hope M. Parrish, Gyllenhaal, Zodiac author Robert Graysmith, Downey Jr., and Mark Ruffalo. Various aspects of production and location set pieces are examined in depth, but the central focus is Fincher's keen (and obsessive) eye for detail. "The Visual Effects of Zodiac" (15:18, HD) displays the evolution of the special effects shots, with explanations from visual effects supervisor for Matte World Digital Craig Barron and visual effects supervisor for Digital Domain Eric Barba. Previsualization comparisons show the pre-viz above the final shots for "Blue Rock Springs" (1:07, SD), "Lake Berryessa" (4:21, SD) and "San Francisco" (1:02, SD). The feature-length documentary This is the Zodiac Speaking (1:42:18, HD with "Play All" option) gathers testimony from actual investigators and witnesses (including victim Mike Mageau) to four Zodiac murders: Lake Herman Road, Lake Berryessa, Blue Rock Springs and San Francisco. In an identical style, "His Name Was Arthur Leigh Allen" (42:35, HD) details the facts and questions surrounding the case's prime suspect. Interviewees include Greysmith, Don Cheney and George Bawart. True-crime buffs and Fincher fans get the version of the film they deserve in Paramount's stellar Blu-ray. All site content © 2000-2019 Peter Canavese. Page generated at 04/22/2019 05:25:40PM.